Making Time for Memories: Stampaganza 2009 Begins Today! Do you love stamps? Well then, you will be happy to know that Stampaganza starts today and we are making it easy to build your stamp collection. From November 3–30, 2009, purchase any two stamp sets (sizes A, B, C, D, and/or E only) at full retail price and you will receive a third stamp set of your choice FREE (of equal or lesser value for your entire order)—a savings of up to $22.95 US / $28.50 CAN! Shipping/handling fees apply. Stamp sets available for FREE include: A, B, C, and D-size sets only. 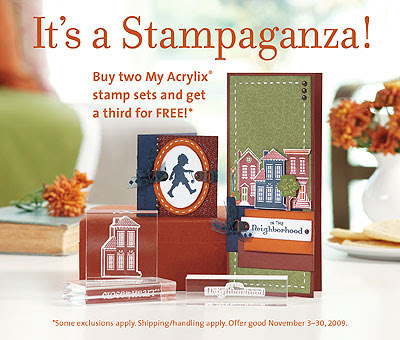 E-size, customizable (K), Stamp of the Month, and Art & Soul® sets are not available as the free set. 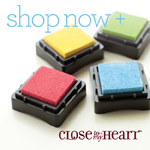 Stamp sets that count toward the qualifying purchase include full-priced A, B, C, D, and E-size sets only. Stamps that do not qualify toward a qualifying purchase include Stamp of the Month, Art & Soul, Workshops on the Go™, and customized (K) stamps. December Stamp of the Month Blog Hop Coming!